Note on Nepal on International page. General Monsoon Information on Nepal and Pakistan Posted Today…. See Vagaries’ International Page. Quantum Forecast :First attempt. 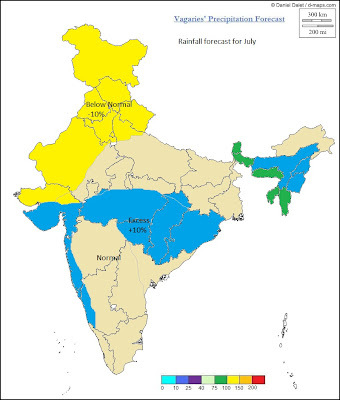 Never in previous years' MW has Vagaries forecasted amounts of Monsoon rain. The weather-altering La-Nina condition in the Pacific Ocean seems to be easing and could be over by June. That’s Nature's cyclical pattern. If conditions do revert to neutral, it could ease forecasting the quantum of this summer's Monsoon rains in India. Most computer models predict neutral conditions through the end of the year, but a few suggest the possibility of a La Nina re-developing. According to the Climate prediction Center/Ncep, a transition to ENSO-neutral conditions is expected by June 2011, which will continue into the Northern Hemisphere summer 2011. Most other models predict a transition to ENSO-neutral conditions during April-June 2011, followed by ENSO-neutral conditions through the end of the year. Reflecting a weakening La-Nina, enhanced convection developed over Indonesia, and the low-level equatorial trade winds remain near-average. The SOI is now lowering in value, and has dropped from +30.5 to +21.5. This would mean normal systems from the Bay, and normal rains for the peninsula south of M.P.during June/July. No excessive rains, i.e. normal precipitation figures for entire interior peninsula and west coast of India for June/July. June /July can produce 3/4 systems from the bay, and support a few UAC specially over west M.P. and Gujarat, which will bring spells of very heavy rains along Karnataka/Goa and Mah. coast, and in west M.P. and Gujarat region (barring Kutch). "July could see some prolonged continous heavy spells. I would expect around 800 mms in July, against a normal of 750 mms." just wanted to know the reason y u think it will rain more than normal in july since u said "The weather-altering La-Nina condition in the Pacific Ocean seems to be easing and could be over by June." am an amateur in this & hence these questions.. are u predicting more than normal rainfall considering that enso will be neutral this year? I was in Kopargaon (Ahmednagar district, the town is close to the Pilgrimage place Shirdi) for the better part of this week. The weather there surprised me as it was much cooler then what I have seen over the last couple of years in the month of May. There was a strong breeze all through the day and the evernings / nights were really cool. In fact one of the nights everyone felt a bit of a chill - completely unexpected for this time of the year. My car's temperature guage never went above 37 degrees even in peak afternoon. @Cmdr. Potey. Thanks. Your views are welcome. @Ron.Actually Ron,if u mean the July figure, 800 mms is not too much above the normal. Its just a shade more, as i expect normal enso to send a couple of bay systems. We have seen 1200 mms or more in July in certain years ! @nt. U r correct. Today A'nagar was 17c (-6)! Pune 19c, and M'shwar 15c. Not good to last too long a period. Rajesh, I am going to be in Nagpur starting tomorrow for a couple of days. How's the weather likely to be there? Extremely hot? Thunderstorms? Pleasant? @svt. Thanks. Please continue with your inputs. May thundershowers for Mumbai,I would say would occur if the SWM were to hit the city before 5th June. We had May showers in 1999,2000,2001,2004 and 2006. I had nothing much to do today, so decided to re-read your older posts (monsoon onset -2008, 2009 and 2010). There is so much to anticipate during this time of the year. My favorite read and the most painful one was year 2009; it showed so much promise and delivered little at the end. Your blogs are a valuable treasure. If possible you should try to capture and document it formally. Keep blogging. @Ananth. Thanks for the kind words.Doing my best to put up the best, and be as accurate as possible. Will not comment on hear and press reports till I am sure. Please feel free to contribute and improve Vagaries' image and outputs.